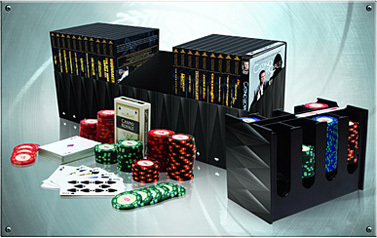 6th November 2007 – James Bond Ultimate Collectors Casino Edition released on DVD! This week sees the release in the UK of a new DVD box-set presented in deluxe acrylic packaging containing the complete MGM Bond library of 20 films from Dr. No through to Die Another Day, plus the new two-disc version of 2006’s Casino Royale starring Daniel Craig. In addition, the collection will feature two sets of branded Casino Royale playing cards and a complete set of poker chips from Carta Mundi, as seen in the film. With the films now available in a confusing array of different box-sets, 2-disc and single editions throughout the world, 007 MAGAZINE presents the ultimate guide to buying 007 on DVD! 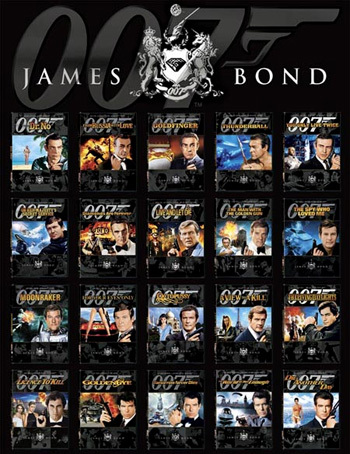 The James Bond Ultimate Edition DVDs were originally released in the UK [REGION 2] in August 2006 to tie in with the cinema release of Casino Royale. The DVDs were housed in a special limited edition attaché case containing all 20 films and also available in single 2-disc editions. The set was re-released in December 2006 in a rather tasteless silver box with the same content. November/December 2006 saw the release in the USA & Canada [REGION 1] with the films split randomly across four box sets. Most of the films have now also been released in single-disc editions featuring the film only, with the only extra features being the commentaries already on those discs. The content of the Ultimate Edition DVDs is the same throughout the world and all regions are presented uncut. Since their original UK release it became apparent that errors in the digital restoration of some of the films meant that changes were made to the later Region 1 editions. A fully detailed breakdown with audio/visual comparisons can be found in our exclusive article available in the SPECIAL FEATURES area of 007 MAGAZINE OnLine. Whilst there is no denying the fact that the Ultimate Edition versions are far superior in picture quality to the Special Editions released in 2000, the remastering process employed by LOWRY DIGITAL IMAGES resulted in some unfortunate colour changes which have been corrected for the most part on the Region 1 release. 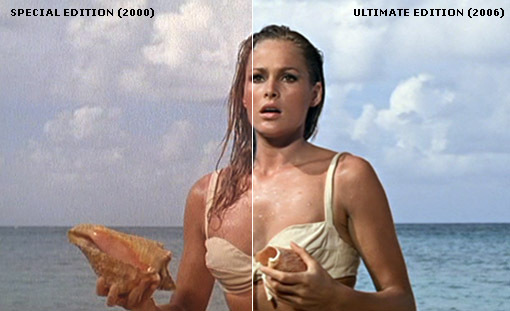 The frame comparison from Dr. No (above) shows the dramatic upgrading in picture quality between the new Ultimate Edition and the original 2000 Special Edition DVDs. The sharpness and clarity of the image reveals far more detail than was present in the earlier version and is one of the most remarkable improvements in the series. The first three films benefit from now being presented in their correct aspect ratio, whereas the SE versions were cropped left and right. The Ultimate Edition DVDs also feature DTS & 5.1 soundtracks remixed by Mi Casa Multimedia and while they do open up the soundstage somewhat and are more dynamic in keeping with the cleaned up visuals, they have been created in such a fashion that some of the original sound effects (and in some cases music tracks themselves) are changed in order to achieve the desired multidirectional sound effect. With the exception of Live And Let Die, The Spy Who Loved Me and For Your Eyes Only, the 'original' (mono or stereo) soundtracks are only available on the Region 1 (USA & CANADA) DVDs. The Region 2 editions do not give the viewer the choice of hearing the film how it was originally made! For a full comparison of the audio/visual differences in the DVDs see our exclusive 007 MAGAZINE OnLine article. The inclusion of Casino Royale (2006) in the latest version of the Collectors Box Sets provides the opportunity to purchase all 21 official James Bond films in one fell swoop. However, since this latest DVD was not produced as part of the Ultimate Edition series it retains its original cover art which stands out from the rest of the collection. It should also be noted that Casino Royale (2006) does differ slightly between regions. Both Region 1 and 2 editions are identical to their theatrical release and contain cuts/substituted shots in order to attain the current rating. 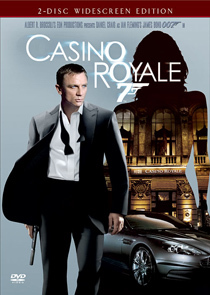 Collectors note: The complete uncut version of Casino Royale (2006) is available in Region 3 (NTSC) [South East ASIA]. The French Region 2 DVD (PAL) is also uncut and includes the original English soundtrack option. The Blu-Ray edition is identical and both items can be easily imported to the UK via Amazon.fr. The R1 release includes the theatrical pre-cut (MPAA) PG-13 release and the R2 (UK) DVD has the slightly cut (BBFC) UK version which removed one shot of a knotted piece of rope handing over Bond's shoulder before the torture scene. The accompanying line of dialogue "Such a pity" as spoken by Le Chiffre (Mads Mikkelsen) is also missing, making the scene play somewhat differently to how it was originally intended by director Martin Campbell. The Region 3 version is essentially the 'directors cut' before changes were made by the various certification boards. Shot of Dryden's contact being drowned in the UK R2 edition [ROLLOVER] Replacement shot in the US R1 version. 2 shots censored from the UK R2 edition but present in the otherwise cut US R1 version.